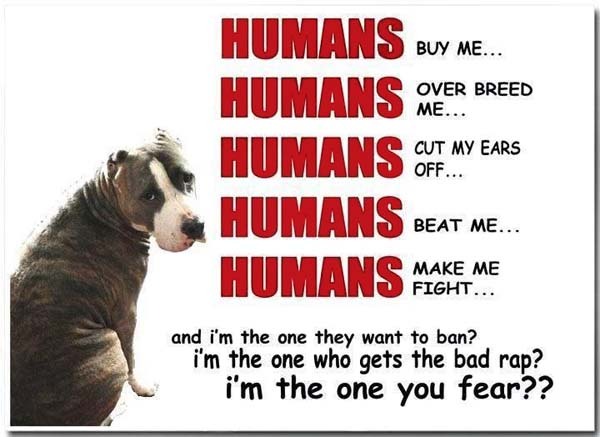 Breed specific legislation is exactly what sounds like … it is the regulation of your right to own, or not own, a dog based solely on it’s breed or the “type” of dog it is. It is not based on whether or not you are a responsible dog owner. 1. Dog problems are generally problems that are due to owner responsibility issues and these problems are not limited to a certain breed of dog. 2. When breeds are singled out as dangerous or vicious, the responsibility for these dogs is removed from the dog owner. Irresponsible dog owners are also less likely to follow the law, and as a result, everyone has to suffer for it. 3. By limiting the ability of citizens to own certain breeds, responsible law abiding citizens will not be able to work with and improve those breeds. These are the types of owners that communities need to encourage, not drive away. 4. Communities that have instituted such bans have often found that the irresponsible dog owners and other criminal elements that use dogs for illegal purposes simply switch to another breed. 5. Breeds and mixes are hard to identify and many dogs are mislabeled and destroyed based on paranoia and prejudice. 6. BSL laws punish those dogs that are good canine citizens. Many breeds can and do function as assistance dogs for handicapped owners, search and rescue dogs, drug-sniffing dogs, police dogs, etc. The American Veterinary Medical Association and several state veterinary medical associations oppose breed-specific legislation for just this reason. 7. The dog most restricted is the “pit bull.” A pit bull is a type of dog, not a recognized breed. 1. Stronger enforcement of existing dangerous dog laws. If they are not already in place, lobby for protection from untrained and unsupervised dogs of any breed or mix. This is a broad-based effort that protects all citizens. Any dog can bite or be a nuisance when owned by an irresponsible owner. 2. Anyone who deliberately trains a dog to act aggressively towards people or other animals, or uses a dog in the commission of a felony or misdemeanor should face additional penalties. 3. Encourage local animal rescue and welfare agencies to provide responsible dog ownership seminars and canine safety education. The American Kennel Club has a free education program created for elementary school children. 4. Protect the rights of all citizens with nuisance ordinances such as anti-barking, pooper scooper regulations and leash laws. This entry was posted in dogs and tagged banned breeds, banned dogs, breed banning, Breed Specific Legislation, BSL, BSL laws, No to BSL, Stop BSL by Iowa Dog Trust. Bookmark the permalink.